Moty & Udi: Can this marriage be saved? Nobody expects the marriage (the Fatah/Hamas one, not the royal one) to last. My view is that it is a marriage of convenience, planned to present the Palestinian Arabs as speaking with one voice just long enough to get the state of ‘Palestine’ declared. Afterward, there will be a divorce and a violent custody battle over ‘Palestine’. One could imagine the IDF taking sides against Hamas in this one. Some analysts don’t agree. They think that adding Hamas to the mix will make it harder to get recognition for ‘Palestine’. After all, Hamas won’t agree to recognize Israel and give up terrorism, etc., and the US and EU are insisting that any Palestinian government do so. But in my opinion, the EU is already beginning to weaken. Although the US could have been counted on in the past, we really can’t predict what this administration will do. One partner in the marriage has already been shown (Gaza, 2007) to be an abusive spouse. So far, the only thing that has prevented Hamas from taking over in Judea and Samaria has been the presence of the IDF, which almost every night arrests Hamas operatives there. You know what will happen if the IDF withdraws! There are some bright spots. “Joe Settler” points out that a married couple shares their liabilities as well as their assets. When Hamas joins the PA, then the PA becomes responsible for Gilad Shalit. Can a responsible government justify holding an innocent citizen of another country incommunicado, for ransom, for almost five years? Not to mention the rockets that are still being fired into southern Israel by Hamas. The new Palestinian government will respect all previous PLO agreements, including the Road-map commitment to an end to violence and the Arab Peace Initiative, and it will move toward establishing a Palestinian state on 1967 borders … How could the EU come out against a government that has the same policies as the EU itself on this region? I don’t think that is an option. Hamas as a movement might have a document calling for armed struggle, but as part of a unity government, it will have to respect the law and it will have to respect the Roadmap … Israel is saying we have to choose between peace and Hamas. But Hamas is part of Palestinian society, it’s part of our people. They must respect the choice of the Palestinian people and see Hamas as part of the [final?] solution, not part of the problem. That’s interesting, since even the PLO never lived up to Roadmap obligations to stop terrorism and incitement, and Hamas has already made clear that they will not compromise their genocidal principles. I also like the part about Hamas being “part of the solution,” but the Israeli response that the Arabs must choose between Hamas and peace is, well, stupid. The PA voted against peace in 2000 at Camp David, in 2008 when it rejected Olmert’s proposal and just last year when it refused direct negotiations with Israel. And Fatah, the dominant PLO faction, rejected peace at its convention in 2009 when it adopted a resolution reaffirming its commitment to armed resistance. So don’t bother saying “the Palestinians must choose.” They’ve chosen, over and over, with and without Hamas. So, Can This Marriage be Saved? Who cares, they’re both jerks. Action alert: Reform Jews, stand up for Israel! 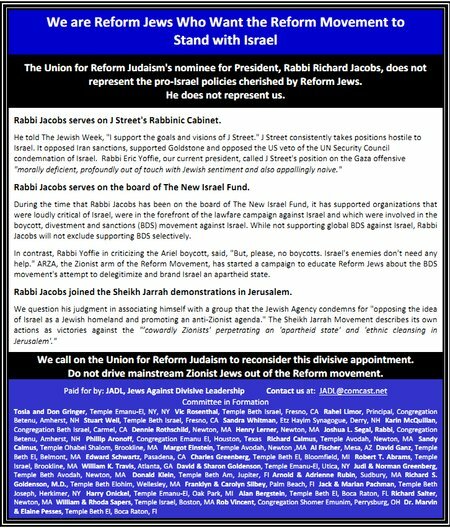 The other day I mentioned a group of Reform Jews called “Jews Against Divisive Leadership” (JADL) who are opposing the selection of Rabbi Richard Jacobs as President of the Union for Reform Judaism. Rabbi Jacobs is an active member of the phony ‘pro-Israel’ J Street as well as the New Israel Fund, which funds anti-Zionist organizations in Israel. If Jews don’t stand up for Israel, who will? JADL is planning to purchase more advertisements in the Jewish media. If you are a member of a Reform congregation and would like to add your name to one of them, email JADL and tell them so! It wouldn’t hurt to send them money, either. Update [30 Apr 1239 PDT]: An incorrect email address was given for JADL. It’s been corrected. The Israel/Arab conflict is reaching a new point of inflection. The status quo which has been in place more or less since the early ’90’s (when the PLO returned to the territories from Tunis) is about to be replaced by a new reality. This change could be peaceful, or — more likely — it could be mediated by the most vicious war in Israel’s history. But possible outcomes could be very different, depending primarily on the actions of the Israeli government. The Hamas/Fatah arrangement, as I wrote recently, is designed to facilitate the creation of a state of ‘Palestine’ in the territories without recognition of Israel, end of conflict, or security arrangements. Such a state would immediately be in confrontation with Israel over settlements, etc., and would be a base for terrorism or outright war. If it were recognized by enough UN members, Israel’s self defense would be seen as aggression against the new state, and could be met with sanctions or worse. But the Arab plan faces an obstacle: the US, and to a lesser extent, the Europeans, require that a Palestinian Authority that includes Hamas must agree to the three conditions of recognition, accepting prior agreements (Oslo) and renouncing violence. Hamas has never been prepared to even pretend to agree to these things. The PA [Palestinian Authority] is only responsible for governing the Arabs in the territories, not with any foreign relations. The fake Hamas/Fatah reconciliation is meant to only address the PA, not the PLO. They won’t hold any elections until after September, if ever. As I wrote yesterday, the introduction of Hamas into the PA means that the ‘peace process’ is over. Israel can no sooner make peace with Hamas than it could have with Hitler. The Oslo accords require recognition, etc., and so the day Hamas joins the PA, the PA will have abrogated the Oslo agreements. But Oslo created the PA. And Oslo recognized the PLO as the “sole legitimate representative of the Palestinian people”. This means that the PA will be illegitimate, and the status of the territories will revert to the way it was defined by UNSC resolution 242: the entire area is disputed, until the parties can agree on secure and recognized boundaries. And it means that Israel will not be required to negotiate with the PLO — something that was illegal under Israeli law before Oslo, by the way. This gives Israel freedom of action from a legal point of view, I think. Of course, in the real world nations do whatever they can get away with. Force rules and diplomacy provides fig leaves. So Israel can’t depend on support from other nations just because it makes a convincing legal case. Annex the large settlement blocs, the Jordan Valley, the ‘high ground’, and anything else that is necessary for security. Re-emphasize Israel’s commitment to a unified Jerusalem under Israeli rule. Publish a map which clearly defines the boundaries of the state. Make a clear statement — and implement it — that Israel will work to provide full civil rights to its Arab and other minorities, but will not give them national rights. The Palestinian Arab state will be outside the borders of Israel, which is defined as the state of the Jewish people. Naturally the Arabs and their supporters will scream bloody murder, including threats of war. Israel’s leaders and supporters must keep in mind that the replacement of Israel by an Arab state is and always has been the goal of the major Palestinian Arab factions. What has happened now is that the mask has dropped, and it will not be productive for Israel to pretend that there is still a possibility of a compromise peace. The possibility of a major war today is greater than it has been for some time. Now to the threat from Hizballah and Hamas, we must add the possibility that Bashar al-Assad will deliberately provoke or join a conflict in order to divert attention from his violent suppression of domestic opposition, and also the possibility that Egypt will facilitate the supply of weapons to Hamas in Gaza. But it seems to me that war will come if and when Israel’s enemies see the possibility of victory — that is, when it appears to them that Israel’s deterrent and defensive capability can be overcome. Israel’s ‘provocative’ actions would have little to do with it — the existence of any Jewish state is sufficient provocation. The best way to prevent war, therefore, is to maintain the strongest possible defensive and deterrent posture. Proposals for appeasement, like the so-called ‘Israeli peace initiative‘, would have exactly the opposite effect. Naturally, the ‘peace camp’ is frantically coming up with new ideas along these lines. The good news is that they will be contemptuously dismissed by the Arabs, who are going for the whole enchilada. Israel is facing a very difficult period in the near future. The way to traverse it successfully is to take a stance that is positive rather than apologetic or conciliatory. So Fatah and Hamas are merging, and will create a unity government for the Palestinian Arabs. Fatah, dedicated to the violent destruction of Israel no less than Hamas, is prepared to say pleasant things in English. Hamas is not. Fatah is willing to take a state on as much territory as it can get, promise peace, and then move toward its objective, as spelled out in its ‘plan of phases‘. Hamas will only agree to a hudna (temporary truce) if Israel withdraws from all the territories. Then the war will continue. Ultimately, although they are quite different in the kind of life they will offer the Arabs in their state — Hamas will enforce Islamic law — there is no difference for Israelis. They will be dead or dispersed if either gets its way. Our program does not include negotiations with Israel or recognizing it … It will not be possible for the interim national government to participate or bet on [sic] or work on the peace process with Israel. Palestinian Authority President Mahmoud Abbas signaled on Thursday that peace talks with Israel would still be possible during the term of a new interim government formed as part of a unity deal with Hamas. But Abbas has refused to negotiate with Israel until now — for 10 months because the official freeze on construction in settlements did not include Jerusalem (although de facto it did), and after that because Israel refused to extend the freeze. Do you think the presence of Hamas in his government will render him more likely to talk? I don’t. Anyway, he has his heart set on getting everything he wants from the UN without having to give up anything to Israel. The ‘peace process’ which began with Oslo is now officially dead. May it rest in peace. Pro-Israel US Congress members are saying that if a Palestinian Authority (PA) unity government that includes Hamas is set up, and if Hamas doesn’t agree to recognize Israel, accept prior commitments of the PA and renounce terrorism, then the US must, by law stop all assistance to the PA. The European Union (EU), also, has demanded that Hamas must meet the substantially equivalent ‘Quartet conditions’ (of course they manage to help Hamas in other ways). I can’t imagine that this will happen. I expect that Hamas will say something, anything, that the Administration will be able to interpret as meeting its criteria for a civilized Palestinian government. The last time Hamas was part of a unity government (2006), Fatah threw them out in response to international pressure and then Hamas took over in Gaza by force of arms (2007). This time I don’t think there will be that kind of pressure. The world has begun to accept the murderous, racist Hamas. We can thank the international Left and the Turks for their flotillas, Israel for its failure to complete Operation Cast Lead, and the weakness of the Obama Administration for not allowing Israel to put real pressure on Hamas. Scenario 1 is that by September the EU, the UN, and everyone else willfully ignores that Hamas is part of the PA government. They go to the UN. Everyone votes for the new terrorist state – the US certainly won’t be a party-pooper and veto it. And presto, instant state. Scenario 2. This summer they launch a full out war against Israel with Hezbollah’s help. At some point they run to the UN and beg for a cease fire, and while they’re at it, declare this their war of independence, which the UN will recognize as such (you can bet they like this scenario better, because it includes a war). In either scenario, they get a state and come October, Hamas takes over. But they don’t care. Phase 2 will have been achieved. The PA isn’t interested anymore in maintaining the fiction of Peace, because they are solely working towards a unilateral declaration of a state and war with Israel. Article Thirteen: There is no solution for the Palestinian question except through Jihad. I hope ‘Joe’ and I are wrong. But I don’t think so. The nomination of Rabbi Richard Jacobs to head the Union for Reform Judaism (URJ) created more than a little controversy. Rabbi Jacobs is an active member and supporter of both J Street and the New Israel Fund, Jewish organizations which claim to be pro-Israel, but whose actions — and in the case of J Street — sources of funding have a distinctly anti-Zionist tinge. Today a group of Reform Jews called “Jews Against Divisive Leadership” published advertisements in the Los Angeles Jewish Journal and the Forward (I’m one of the signatories). The LA ad appears above. Apparently the editors of the Journal couldn’t let it go unrebutted, and so solicited an op-ed from several prominent Reform rabbis to do so. Rather than defend the positions taken by Rabbi Jacobs, these rabbis chose to simply attack the motives and politics of his critics. Some years ago I taught a class in elementary logic. The rabbis’ essay would not have gotten a passing grade. The current advertisement means that a handful of Reform Jews have now joined previously Right-leaning critics who in recent weeks have challenged the Zionist credentials of Rabbi Jacobs. The claim is that Rabbi Jacobs’ involvement with groups promoting human rights and social improvement aligns him with crazed extremists. Of course “right-leaning” is in the eye of the beholder, and the direction of lean has nothing to do with the soundness of the critics’ claims. And I don’t see the phrase “crazed extremists” in the ad, do you? So why do the rabbis say “the claim is…” when that isn’t at all what the ad says? 1. If American Jews related to Israel the way Rabbi Jacobs and his family do, nega’ ha-netek [the plague of separation] would be in retreat. He cares deeply about the country, has strong relationships with many Israelis, encourages bilateral encounters and programs in his synagogue and through his work in the larger Jewish community, studies in Israel and even owns property in Jerusalem. He comes to Israel several times every year, and spends every summer studying sources with curiosity and profundity at the Shalom Hartman Institute. He is a passionate Zionist, who devotes time and love to the State of Israel. By any dispassionate standard, Rabbi Jacobs is part of the solution to the challenges confronting American Jewish engagement with and support of Israel, not part of the problem. In the paragraph above, we find two common fallacies: the red herring in which irrelevant facts are presented as if they are evidence for an unrelated conclusion, and begging the question, in which the writer assumes that which he wishes to prove. Clearly the fact that someone visits Israel doesn’t imply that he is a Zionist — some of the most ‘passionate’ anti-Zionists live there year round. And simply calling Rabbi Jacobs a Zionist does not establish that he is one. 2. By setting the battle lines in the way they are currently doing, Rabbi Jacobs’ critics are sailing in very dangerous waters. They argue that any demurral from the current party line of Israel’s government is disloyal. If this position prevails, the plague of separation will reach epidemic proportions. The old parliamentary notion of “His Majesty’s Loyal Opposition” is an important idea. “They argue that any demurral…”? No they don’t! Nobody ever argued that. Talk about straw men! Where do the rabbis find such a statement in the ad? Or in my “right-leaning” blog, for example? 3. Let us also face facts. A significant number of North American Jews of a liberal disposition under the age of 40 are less and less likely to make Israel a central part of their lives. Yet, a small and highly influential committed core is swimming against the tide, and developing meaningful models for engagement for this cohort with Israel at this dramatic and uncertain time is a necessity for all of us who love and support the Jewish State. In Rabbi Jacobs’ example of encounter with Israel, in his willingness to confront complexity and face up to unpalatable realities, in his infectious enthusiasm and immense charm, he is a model for such younger Jews. To vilify him is to alienate them still further. Agreed, many Jewish liberals do not support Israel. How is Rabbi Jacobs significantly different from them? What is his “meaningful model for engagement”? Participating in an anti-state demonstration? Is that what “confronting complexity” means? Further, the ad does not ‘vilify’ anybody. It simply draws attention to Rabbi Jacobs’ actual positions and associations, suggests that these are best characterized as anti-Zionist, and asks if someone who takes these positions is a suitable leader for the largest denomination in American Jewry. 4. The fact that those who have assaulted Rabbi Jacobs’ integrity have wrapped themselves in the flag of Zionist purity is particularly galling. Since its inception, the Zionist movement has provided a forum for a range of opinions. If these self- appointed purists try to bar a great congregational rabbi whose views represent the mainstream of the American Jewish community and the Reform Jewish Movement from the fold of the True Believers, who wins? The campaign to discredit the work of the New Israel Fund (which hundreds of Zionist rabbis support) shows all the symptoms of separation plague — self-righteous certainty, disregard for nuance, allergy to reason and a strong appetite for the whiff of a witch-hunt. Support for Israel is not the exclusive property of one party or another. I’m tired of repeating myself, but we did not “assault Rabbi Jacobs’ integrity.” I’m sure he is as honest and fair as the day is long. But we strongly disagree with his politics, and we think they are inimical to the survival of Israel as a Jewish state. I am not sure about what wrapping oneself in the flag of Zionist purity is, but this brings me to the next fallacy that is so prevalent in this piece: I call it the Humpty Dumpty fallacy (apologies to Lewis Carroll): the view that words can mean whatever one wants them to mean. ‘Zionism‘ is a word that already means something, and the rabbis cannot simply redefine it to mean “knowing what’s good for Israel better than Israelis themselves,” as they seem to want to do. 5. Anyone who knows Rabbi Jacobs will tell you that he is a mature and wise man. He cares. He learns. He is a mensch. He is the farthest from a fanatic one can possibly imagine. In fact, Rabbi Jacobs lives his life striving for balance, humanity and depth. In the struggle against the plague of separation, he is staffing the ER. OK, granted. I am sure he would be a good guy to have a beer or be in a foxhole with. But what does that have to do with his positions about Israel, and in particular what American policies toward Israel ought to be? May I suggest that this better characterizes the writers themselves? Update [1824 PDT]: The other ad was in the Forward, not NY Jewish Week. Corrected.